Dish on Delish by Lee Hock: 4-20-2011 Vamos Argentina! I know I have told you before, but my hubby King Hock, is obsessed with Argentina. When he was 22, he went on a trip across South America. When he got to Buenos Aires, Argentina, it was love at first site. He then, promptly decided to pick up and move there. His love affair continued while living there for 6 years. At 28, he decided it was time to come back to the US, he missed his family too much. Argentina still holds a special place in his heart. I have been fortunate enough to visit there a few times. Upon arriving my first time, I instantly fell in love too. For me it was 2 things, shopping and the food. The shopping there is incredible, great prices and unique fashions. The food was what really sealed the deal for me. I can go on and on about it for hours. I love their coffee shops, steak houses, gelato shops, empanada stands, and their bakeries. The first thing that comes to most people's minds when Argentina is mentioned, is beef. They are famous for their meat, particularly grilled. 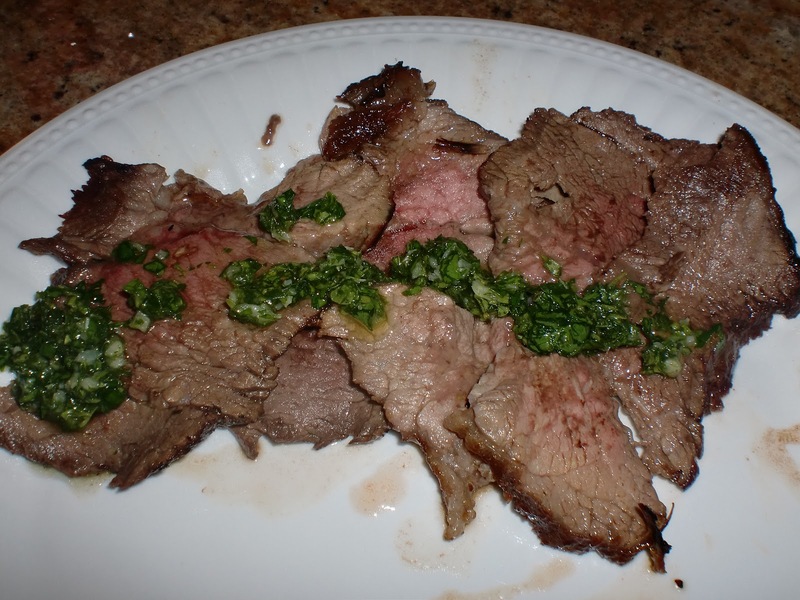 The meat is always served with chimichurri sauce, something I could not get enough of while I was there. King Hock got a taste of his second home tonight because I made an Argentinean dinner. Our dinner was fantastic! 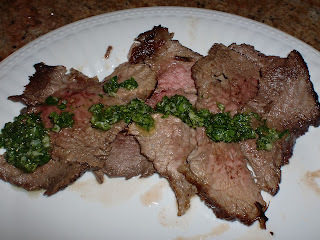 We had: Grilled London Broil with Chimichurri Sauce, Puree de Calabaza, Ensalada con Palmitos y Salsa Golf Viniagrette, and Ensalada de Remolacha. Pics and Recipes are below. Also, this morning I made some Very Berry Passover Muffins, which are all gone now. I got the recipe for these moist muffins from my friend Sarah. Thanks Sarah, they were a hit! You can find that recipe below too. Mix all of the above marinade ingredients, in a gallon size Ziploc baggy. Add the London broil, press out the extra air and seal the bag. Place into the refrigerator and marinate for at least 8 hours, overnight is best. Turn the meat over in the marinade half way through. Heat the grill. Remove meat from the marinade and discard marinade. Grill 10-15 minutes per side, depending on the size and thickness of the meat, and how well done you like it. Let rest 10 minutes covered with foil. Slice across the grain into thin slices. Crush the garlic into a medium sized bowl. Mince the parsley and oregano, very finely. Add to the bowl. Add the crushed red pepper. Whisk in the vinegar, then the oil. Then the salamuera. Place into a jar with a lid. Let sit for at least an hour before serving, the longer the better to let the flavors develop. Can be stored in the refrigerator for 2-3 weeks. This translates to puree of pumpkin. In Argentina they use a pumpkin or squash we cannot find here in the US. 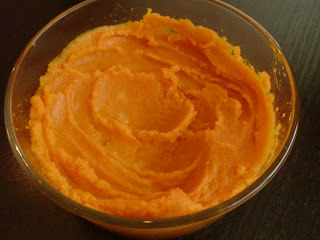 I was able to replicate a very similar version with butternut squash. Cut the squash in half, and remove the seeds. Place cut side down in a greased baking dish. Bake for 45-60 minutes until easily pierced with a fork. Remove from the oven. Let cool on the counter, until you can easily handle it. Peel of the skin, and place the flesh into a bowl. Mash until smooth. Serve immeadiately or keep warm in the oven at 200 until ready to serve. Hearts of Palm is a very typical food of Argentina. Salsa golf is the most popular Argentinean condiment, think our ketchup. In a large bowl, toss together the above ingredients. Whisk together in a small bowl. 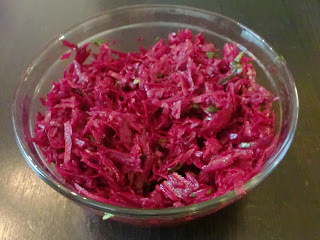 Remolacha= Beets, another very typical Argentinean food. I found this delicious recipe on snack-girl.com, Snack Girl suggest keeping a batch of this in your fridge for a quick healthy snack. My hands are stained a beautiful shade of red, you may want to wear gloves. 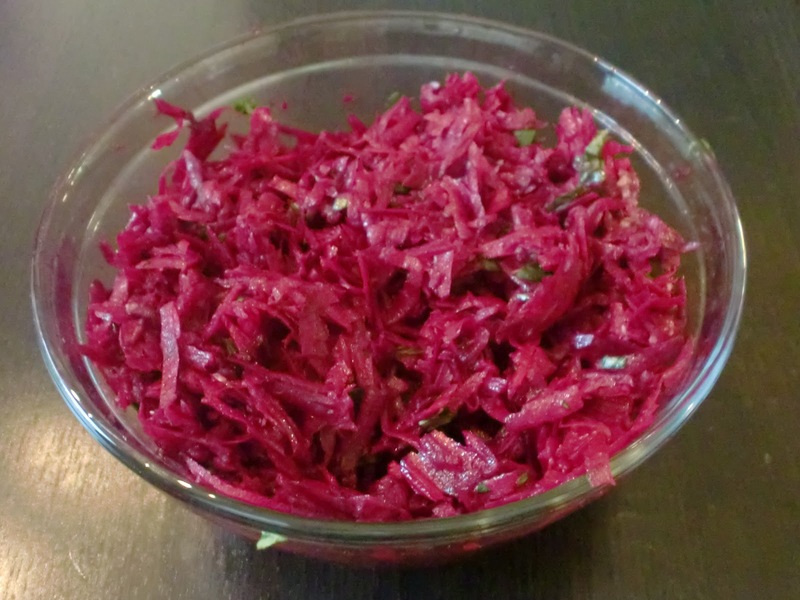 Grate the beets and place in a medium salad bowl. Add the orange juice, lemon juice, olive oil, herbs, and salt. Mix together completely. These are sweet, maybe that is why they disappeared so quickly. I am going to make them again tomorrow. I changed the original recipe slightly. Preheat oven to 350 degrees. Line a muffin tin with muffin liners. 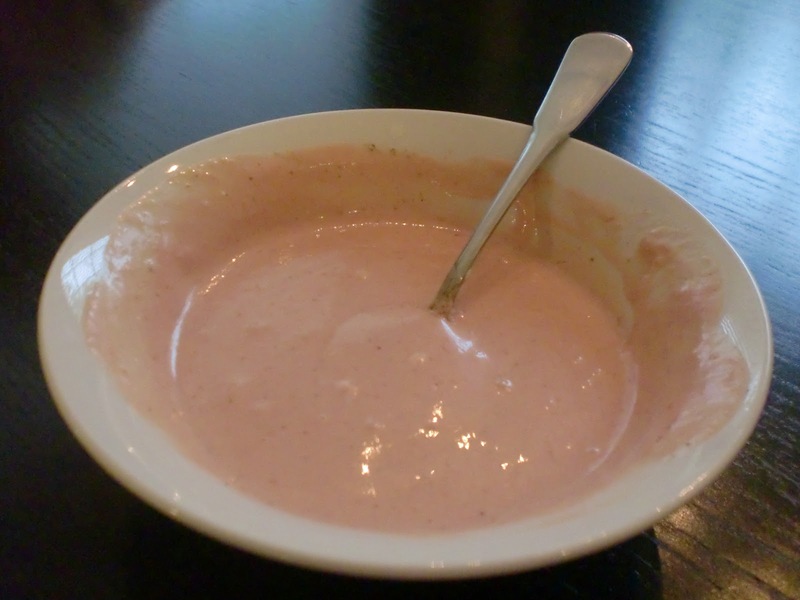 In a large bowl mix together the above ingredients, until combined, do not over mix. Spoon into muffin cups, filling 1/2 full. Bake for 30 minutes. All of this talk of Argentina is making me want to hop on a plane right now. Buenos Noches, Good Night!